Ariel youth movement conference at the Western Wall denied entry over magnets with prayer for the Third Temple on them. Discrimination against Jews at holy sites has reached new heights, the chairman of the Ariel Zionist youth movement told Arutz Sheva Sunday. Western Wall plaza security guards prevented a group of teenage girls from praying at the Wall Saturday, after finding that the Ariel group had wanted to pray for the building of the Third Temple, Nava Hershkovitz, Ariel girls' division chairman, revealed in an exclusive interview. Hershkovitz says that the whole incident took place during the 'Jerusalem Shabbaton,' a conference weekend which sees hundreds of teenage girls involved with the youth group stay by families in the Old City. Over a thousand participants were expected to attend, and the movement's leaders prepared magnets with the prayer as a welcoming gift, Hershkovitz said. The same magnets were given out during last year's ceremony, she noted - also at the Western Wall plaza. This year, however, the girls were stopped at the security checkpoint and told they could not enter the plaza with the magnets, which would have to remain at the barrier until the group left. "The girls arrived at the security checkpoint," Hershkovitz recounted. "Usually security is less strict on Shabbat, but the guards told the girls they could not enter with the prayer magnets." "I arrived at the guard post and spoke to the security detail there, explaining that there is no [security] reason not to distribute the magnets," she continued. "They told me that the magnets are restricted as a general guideline and that they would be denied entry." Hershkovitz also noted that the guards asked her to go to police over the sudden policy change with a complaint, but she stated that she has lost faith in the Israeli Police and declined. The youth group leader noted that while the incident seems small, she is also wary of a system which dictates what to pray. "Ultimately it's written in our siddurim [prayer books], but it gives us great pain that we could not distribute the prayer openly," she said. 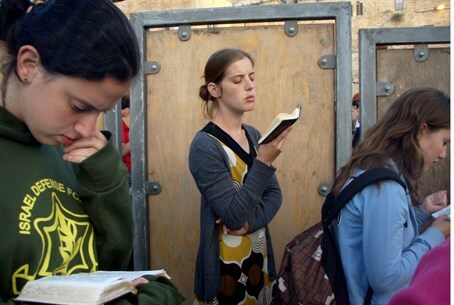 "They tell us that we can pray at the Western Wall, but then they watch carefully what we actually say there."